A motion by County Supervisor and Metro Board Member Mark Ridley-Thomas would grade-separate the planned Crenshaw Light Rail Line for twelve blocks from 48th Street to 59th Street along the Crenshaw Corridor and would require the construction of a station at Leimert Park. Both grade-separating the Crenshaw Line and the Leimert Park Station are listed as “optional” in Metro’s most recent corridor studies. To pay for the grade-separation and new station, Ridley-Thomas asks Metro to identify funding sources “including but not limited to” Measure R funds for the Expo Line and for the Green Line to LAX, the Arbor-Vitae interchange project and sales of “surplus property” along the right-of-way that won’t be used. The Crenshaw Line will run below-grade for the rest of the route along Crenshaw Boulevard. Ridley-Thomas’ motion has strong support within the Crenshaw and South L.A. communities, even if his motion placing Measure R projects against one another and possibly shuffling funds approved by voters has raised the ire of transit advocates and is probably politically impossible. 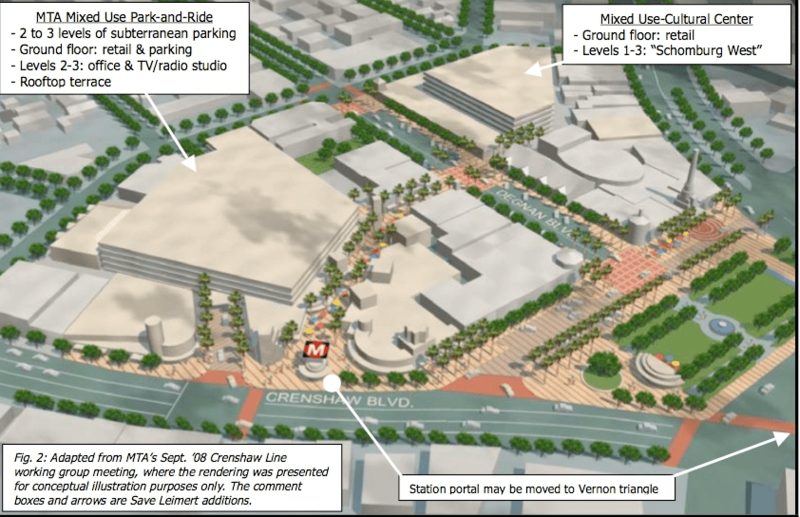 The Fix Expo/Crenshaw Subway Campaign published comments from “Save Leimert Park” urging Metro to move forward with not just a station plan, but a mixed-use development and parking plan for the Leimert Park area.. It would seem that someone in Metro must agree with them. How else could one explain locating the press conference announcing a $543 million federal loan for the Crenshaw Line at Leimert Park back in October of last year, well after the Leimert Park Station was deemed optional. Meanwhile, the community group Hyde Park Organizational Partnership for Empowerment (HOPE) is advocating for increased grade separation for the rail project. Noting some of the safety issues that exist with the Blue Line, which also runs through a predominantly minority community, Winnifred Jackson slams the at-grade proposal for the 12 blocks between 48th Street and 59th Street. HOPE believes the rail line should be underground in our community for many reasons. The thought of 225-ton trains running 40 mph at street-level down the middle of Crenshaw Blvd is daunting. Even if the (mostly black-owned) small businesses survive the four long years of disruptive street construction, after the line is built Crenshaw Blvd will lose half its parking. With trains crossing every 2½ minutes during rush hour, traffic congestion will worsen. The safety risk to motorists and pedestrians, particular our children, is concerning. A similar rail line, MTA’s Blue Line, which runs through black/brown communities of Compton, Willowbrook, Watts and South L.A. has killed over 100 people, including many children, in over 875 accidents. Thousands more have been injured. While nobody has gone on record saying that either grade-separation nor the Leimert Park Station are a bad idea, there hasn’t been much support from transit advocates for Ridley-Thomas’ proposal. The Ridley-Thomas motion asks for Metro staff to study how to fund the increased grade separation route and new station, not to dedicate the funds by themselves. To move Measure R funds, it would take a 9-4 vote of the Metro Board of Directors. It’s hard to imagine getting that vote without the support of Mayor Antonio Villaraigosa, who controls four votes on the Metro Board. The Mayor’s office declined to comment on the Ridley-Thomas motion. Transit advocates Dana Gabbard and Ken Alpern, each speaking for themself, took issue with the Ridley-Thomas motion. Commenting for this article Gabbard, slammed Ridley-Thomas’ claim that there would be significant time savings for passengers using the Crenshaw Line to connect to the Green Line and a future stop at LAX, slams the idea of repurposing Measure R funds, and suggests a local funding alternative for the proposal. He overstates time savings to LAX, which the Hatch Mott McDonald analysis (p.43) shows as being 1-2 minutes with the Crenshaw underground section included–for the vast funds Ridley-Thomas is trying to capture that is a result which isn’t by any stretch of the imagination worth pursuing. Caterwauling is no justification for prioritizing transportation spending or overturning the results of a county wide vote. We must resist weighing down Measure R with un-needed gold plating. If the residents want it, they can form a special district and tax themselves to pay for it (much like Berkeley paid for the tunnels they asked BART be placed in). Alpern is a lot more understated in an article in last Friday’s City Watch where he praises the Supervisor’s vision for the Corridor but opposes any transfer of Measure R funds. So while it might be a very, very good idea to find extra funding to make this huge, long north-south passenger rail line as rapid, safe, useful and high-capacity as possible, it’s a very, very bad idea to set one region of the county (the Mid-City/Crenshaw region) against other regions (the Westside and South Bay). No one wins that battle. So let’s hope that Supervisor Ridley-Thomas has a few creative ideas that remain unclarified in his efforts to make the Crenshaw/LAX Line the best it can be. A “Mark-Up” is a good idea, but an wanted inter-regional dust-up is “off the Mark”. We won’t have to wait too long to see how the Metro Board is going to view the Ridley-Thomas motion. The Measure R Project Delivery Committee will hold a hearing on the motion this Wednesday (full agenda:here) and the Metro Board of Directors is scheduled to hear the motion during next Thursday’s meeting. Why don’t we get the real estate developers that will benefit from the line to pony up some money for the grade separation, and/or institute a special tax district around the stations for some value capture? And hell, if it’s going to be grade separated, why don’t we go heavy rail instead of light? The value capture idea makes sense, but heavy rail does not, because it forces you to grade separate everywhere, even though that wouldn’t make sense along various portions of the line. And it would prevent inter-operation of trains with the Green line, which is part of the plan. Agreed. I like the idea of grade separating around this station area. Excellent urban opportunity that shouldn’t be passed up. And isn’t this the part of the study period to have these debates, instead of before and DURING construction? And also agreed, all the metro jurisdictions need to work together nicely. There are plenty of other metro regions around the country that will get their acts together to get their hands on new investment. Everyone in Los Angeles, including all the detractors of Expo Line Phase 1, need to realize that the massive cost of underground LRT goes hand in hand with a neighborhood agreement for more development. You can’t have the Crenshaw Line buried under Crenshaw Boulevard then expect the neighborhood to remain in the same low-density state. The specific issue of a tunnel under Leimert Park ignores the nagging issue of the Crenshaw Line already being a very poor return on investment. Projected ridership is around 20,000 a day for a line that could end up costing 2 billion. Expo Phase 1 after the fiasco and cost overruns is coming in a hair under 1 billion and I wouldn’t be surprised to see 50,000 riders per day on the first year of operation. Once extended to Santa Monica, I bet Expo will overtake the Blue Line as the busiest in LA. With limited funding and other corridors begging for improvements (South Vermont, El Monte Busway Upgrades, Purple Line to Santa Monica, Sepulveda Pass) Metro needs to economize on lines that are serving relatively few riders. You know. This is an excellent opportunity, for the political coalition that built around the bike plan to work with the political organizations in South LA. After all, even though Metro is the main player in all this, the City needs to have a major role in this thing. So an important thing really is to coordinate DOT and BOSS in their roadway improvements and leverage that investment in combination with station design. The Bicycle Coalition has been very good at keeping DOT momentum by organizing subcommittees and getting at least DOT and the Council to talk to each other in a meaningful way. That kind of action could be very powerful in South LA, because the condition of the roadways is a low hanging fruit. It needs to be repaired, which can be an opportunity to improve bus, ped, and bike row. This is a good opportunity to use Pedestrian LOS standards to identify needed pedestrian improvements and get the right agencies at the table to go after funding. What a lovely corporate and car friendly mall Ridley-Thomas has planned! It is just what the small independent businesses of Liemert Park need: more free car parking for a closed-door government subsidized mall surrounded by a moat of overly wide car-only boulevards! This model has worked successfully for years in Los Angeles to reduce congestion caused by pedestrians shopping and small businesses staying open. They forgot to add Ridley Thomas’ secure undisclosed bunker from which he’ll command minions of this mother ship to extract capital from the area. Not mentioned, but still present, in this rendering: UFO landing pad. From Chavez Ravine to Leimert Park, we’ll have the parking lots required for an extraterrestrial invasion … FINALLY! Cheap property next to an amazing, subterranean, light rail line with C4 building rights? Yeah, what a waste! This will be a bonanza FOR TERRORISTS to make a profit developing along this commercial corridor. Because the developers that will profit from this /= the property owners that you are proposing we tax. Derp derp. Crenshaw is a wide wide street. They need to put in separated cycle tracks on both sides of the street! I prefer the LADOT’s/LA County preferred nomenclature: terrorist tracks, socialist lanes, or commie canals. Studies show that bike lanes in poor neighborhoods lead to abortions, union members, and Obama voters. I’m glad Ridley Thomas is there to keep the cars flowing! BTW, I do support the station at Vernon/Leimert Park. But I think the tunnel through Park Mesa Heights is wasteful and unnecessary. Crenshaw is a very wide boulevard through that area. Not worth the extra $219 million. The FixExpo coalition insists on creating fear and comparing the safety of new at-grade light rail to the first one completed over 20 years ago. I’m sure Metro has improved its safety design since then. Why don’t they compare to the Gold Line as well? We’ll see how the safety record of Expo holds up in practice. Even if in the worst case the Crenshaw line were as accident prone as the Blue Line, how many people have died in auto and bus accidents in the same corridor over the last 20 years? I venture to guess it’s at least 100 given that over 20 years, thousands of people have died in vehicle crashes in LA county. Just recently a grandmother in a minivan crushed my rear wheel and I flew off my bike into the middle of Crenshaw Bl. From my perspective, a minivan is much more dangerous than a light rail train without a doubt. As I walked away from the committee meeting, It dawned on me what this whole motion is, an attempt to circumvent Metro’s Grade Crossing Policy, which is what this whole Park Mesa item has been about.